Joe Flanigan (born January 5, 1967) is an American writer and actor best known for his portrayal of the character Major/Lt. Colonel John Sheppard in Stargate Atlantis. Flanigan was born Joseph Dunnigan III in Los Angeles. He has said that his mother, Nancy, left his father soon after he was born and that his surname was changed to Flanigan after he was adopted by his stepfather, business executive John Flanigan. When he was six years old, his family moved to a small ranch near Reno, Nevada. From the age of 14, Flanigan attended a boarding school in Ojai, California, where he appeared in the school production of A Streetcar Named Desire. He later earned a history degree at the University of Colorado where he appeared in the play Coriolanus. On the advice of a friend, he took acting to overcome his shyness but did not plan to pursue a career in acting. As part of the Junior Year Abroad program, Flanigan spent a year studying at the Sorbonne in Paris, where he learned French. After graduation, he pursued a writing career. He worked on Capitol Hill and then briefly for several New York City publications, including Town & Country and Interview magazine. On the advice of some of his friends, he studied at the Neighborhood Playhouse, was coached by Gerald Gordon, and then moved back to Los Angeles in 1994 to pursue an acting career. Flanigan had guest roles in numerous television series including Profiler, First Monday, and Sisters, until he got his breakthrough with his role on Stargate Atlantis as Lt. Colonel John Sheppard. He lived in Vancouver, British Columbia, Canada, where the series was filmed during the week, and flew to Los Angeles during the weekends where his wife and children resided. He additionally wrote for the series and created the stories for the Stargate Atlantis second season episode "Epiphany" and the fourth season episode "Outcast". In September 2007, scifi.com's SciFi Wire service reported that, "Talent agency UTA filed suit on Sept. 24 against Stargate Atlantis star Joe Flanigan in Los Angeles Superior Court, claiming that the actor owes $99,225 in commissions, according to The Hollywood Reporter; Flanigan's manager, John Carrabino, told the trade paper about the lawsuit: 'I had no idea they did this. This is the first time I'm hearing about this.'" UTA filed a similar lawsuit against actor Wesley Snipes who was equally surprised. This suit was settled in December 2008. Flanigan appears in Brooks Institute photographer John A. Russo's upcoming book About Face. Part of the proceeds are to be donated to Smile Train. Flanigan features in the contemporary public artwork, Metascifi (2015) by artist Martin Firrell. Metascifi presents social comment, and philosophical truths about living well, derived from observation of popular American television science fiction. The project features performers and characters from Stargate, Star Trek, Farscape, Firefly and Warehouse 13. As the ‘meta’ element of the title suggests, the artwork invites Flanigan to comment on the wider social and narrative significance of his Stargate Atlantis character John Sheppard. Most notably, he speaks about the sexual attraction of the archetypal action hero, suggesting it is the impression of the hero’s agency in the world that underpins people’s attraction to characters of John Sheppard’s nature. Flanigan married Katherine Kousi, an actress and painter, in 1996. They have three sons. In early 2014, it was announced they had separated. Flanigan took two prizes in the Waterkeepers' Alliance downhill skiing competition at Lake Louise in January 2006, an event fellow Stargate lead Richard Dean Anderson has attended as well. He currently resides in Malibu, California. On November 10th 2018, the Malibu home he was renting from a local family was lost in the Woolsey Fire. 1997 Murphy Brown Scott Hamon Episode: "From Here To Jerusalem"
1998 Dawson's Creek Vincent Episodes: "Tamara's Return" and "Full Moon Rising"
Cupid Alex DeMouy Episodes: "Meat Market", "Pick-Up Schticks", "Heart of the Matter" and "End of an Eros"
1999 Providence Dr. David Marcus Episodes: "Blind Faith", "Taste of Providence", "You Bet Your Life" and "Pig in Providence"
2000 Profiler Dr. Tom Arquette Episodes: "Besieged", "Proteus", "Paradise Lost" and "The Long Way Home"
Birds of Prey Detective Claude Martin Episode: "Prey for the Hunter"
Judging Amy Tobin Hayes Episode: "Damage Control"
2003 Tru Calling Andrew Webb Episode: "Brother's Keeper"
2004 CSI: Miami Mike Sheridan Episode: "Slow Burn"
2006 Stargate SG-1 Lt. Col. John Sheppard Episode: "The Pegasus Project"
2007–2008 Women's Murder Club FBI Agent John Ash Episodes: "To Drag & To Hold" and "FBI Guy"
2009 Warehouse 13 Jeff Weaver Episode: "Elements"
2011 Fringe Robert Danzig Episode: "Neither Here Nor There"
2012 Metal Hurlant Chronicles Hondo Episode: "Master of Destiny"
2013 Major Crimes Rick Marlow Episode: "All In"
2019 SEAL Team General Trask Episode: "What Appears To Be"
^ Reno Gazette Journal, March 9, 2008. ^ KTLA Morning Show interview, June 22, 2007. ^ info@weblo.com. 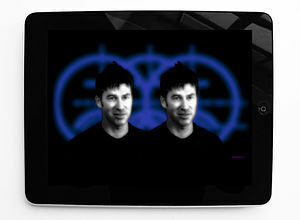 "Joe Flanigan - Celebrities at Weblo.com". www.weblo.com. ^ Joe Flanigan, Burbank Stargate convention, July 2005. ^ Luba, Frank. "Stargate cast members ready for new portals." The Province, June 17, 2007. ^ John Sheppard Bio, SCIFI.COM; accessed May 18, 2015. ^ Gerald Gordon website; accessed May 18, 2015. ^ Simmons, Leslie. "UTA Sues 'Stargate' Actor," The Hollywood Reporter, September 25, 2007. ^ About Face (book), aboutfacebookproject.com; accessed May 18, 2015. ^ The Smile Train: The World's Leading Cleft Charity Archived 2008-04-01 at the Wayback Machine; accessed May 18, 2015. ^ "The Art and Philosophy of Star Trek and Stargate, SFX Magazine". London. 19 January 2011. Retrieved 11 April 2016. ^ "A New Species of Science Fiction, SFX Magazine". London. 6 August 2012. Retrieved 11 April 2016. ^ Gosling, Sharon (July 2005). "Foreword by Joe Flanigan". Stargate Atlantis: The Official Companion Season 1. London, UK: Titan Books. p. 7. ISBN 1-84576-116-2. ^ "Gateworld Forum". Gateworld.net. Retrieved 2006-10-30. ^ "A profile of Joe Flanigan at PMC Magazine". 2011-03-01. Retrieved 2013-02-04. ^ "TMZ". TMZ. Retrieved 2014-09-23. ^ Burroughs, Alexandra. "Avalanche of stars descends on Lake Louise" Calgary Herald, December 28, 2005. ^ "Watch the trailer for Joe Flanigan's Ferocious Planet!". Gateworld.net. Retrieved 2011-03-08. ^ "6 Bullets". 17 November 2012 – via www.imdb.com. 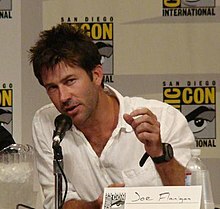 Wikimedia Commons has media related to Joe Flanigan.